Posted by cath in bread, ingredients, Recipes, vegetables. Can a sandwich really be a recipe? 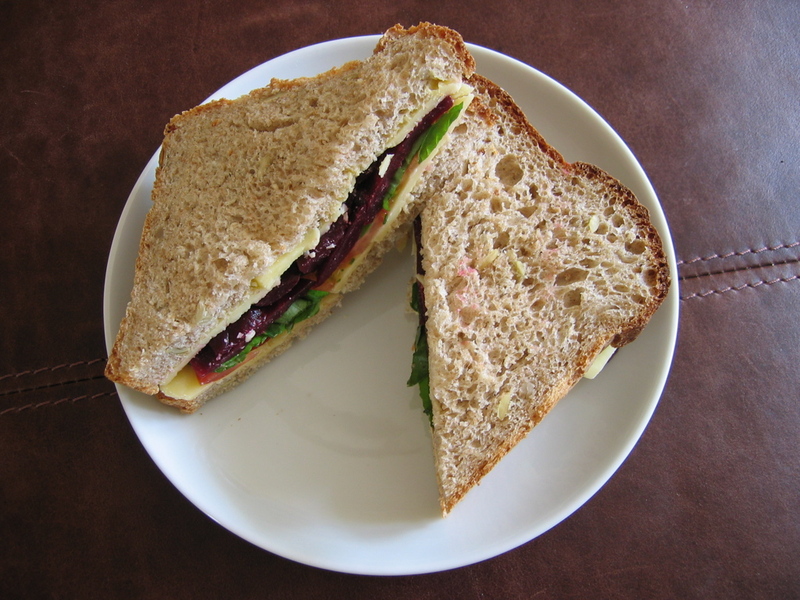 well, who cares – having made some beautiful home-baked bread, what better way to enjoy it than to have some healthy sandwiches. Posted by cath in drinks, easy, Recipes, summer. First, thanks to Tracy for pointing out this basic recipe for Ginger beer courtesy of Giles Paterson (see the original recipe here). In my usual way I made a few alterations – basically, the recipe was great, but I wanted it extra gingery and more lemony, so this year I’ve managed to perfect it (she says)! Well, my official taster said it was as good as the Black Isle Ginger Beer, so I’m pretty pleased. Preparation Time, 10 minutes. Brew for 24-48 hours, chill for a minimum of 4 hours. Mix the grated ginger into the lemon juice and add this to the bottle. Now carefully fill the bottle up to about 1-2inches from the top – leaving room for expansion. 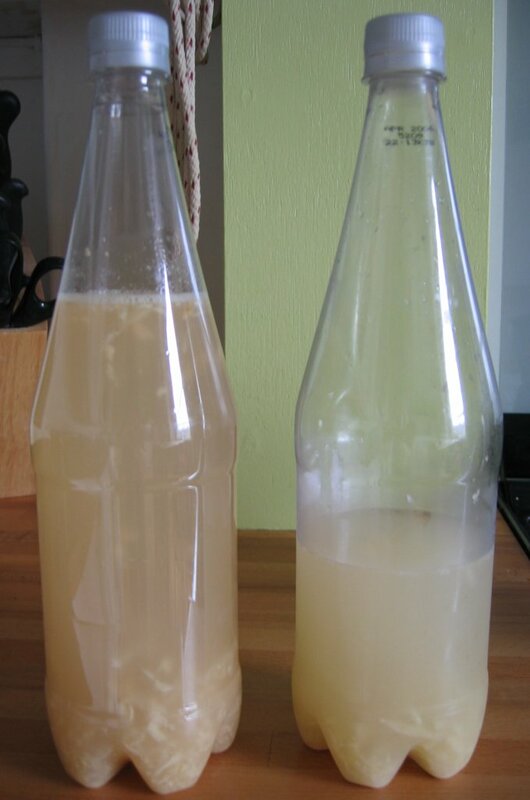 It’s quite hard to open the ginger beer without it fizzing out of the bottle, so leave more rather than less here. Put the cap on the bottle tightly then put it somewhere warm – a warm room or airing cupboard/boiler room should suffice. Leave it in the warm for 24-48 hours to brew. The bottle will become hard after 1-2 days. I usually leave mine for 2 days to get the most flavour and fizz. Don’t leave your bottle in the warm place for too long – there have been stories of explosions, although I’ve not experienced that! Place the bottle in the fridge to cool, usually overnight or for several hours. This stops the yeast and holds the brewing process. Once chilled, open carefully over a sink. As we’ve brewed the beer in the bottle, it is quite fizzy and wants to explode out as soon as you open the top, even just a crack. It will begin to fizz as soon as you begin to open the lid, so watch it and go slowly. Be careful and patient. Once opened, it will be easy to open and close from then on. 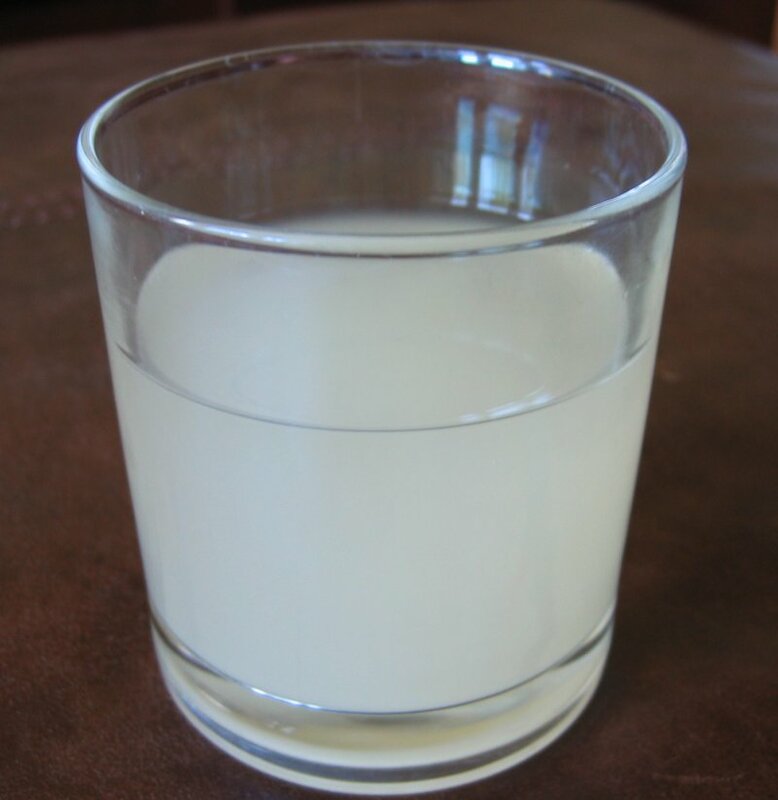 Pour your ginger beer through a tea strainer to remove the chunks of ginger and serve straight away. Posted by cath in general info, herbs, Info and Cooks Notes, ingredients, Recipes. …Not any longer! Now I grow my own herbs on the windowsill. Well, to be more accurate it is a table by the window and I still don't have corriander or oregano, but it has revolutionised cooking and taking care of, snipping and using the homegrown herbs is a great feeling. Now I was suspicious at first, after all, growing herbs indoors seemed a bit lame…but I live in a sunny flat and I've always wanted to give it a go. I've gradually built up the collection but now have several basil plants, some mint and chives grown from splitting and repotting "growing herbs" from the Coop, and some plants from Dobbies (Garden Centre): a largish pot of garden mint, a small black peppermint plant, thyme, lemon thyme, marjoram, rosemary and parsley. In the kitchen I've also got my Bay tree and some chives. All the herbs are a couple of months old now, and they are all doing very well. For the small expense at the garden centre, I've got more herbs than I need and they are growing strongly. Even my attempts to repot individual basil and mint plants from the shops has been a massive success. We've had plenty of basil for tomato sauces, cheese sandwiches and other pasta and vegetable dishes…we've also been drinking up plenty of fresh mint tea in the evenings and have made mint sauce and Laab (thai salad) with the growing mint too. In fact, the more I use the herbs, the more they grow…it's been a real time and money saver all in all, and a very tasty one too! I grow most of the herbs in a sunny (south facing) window of a small room – door closed most of the time, it's my personal greenhouse. The room is not draughty at all and gets quite hot in the summer sun. 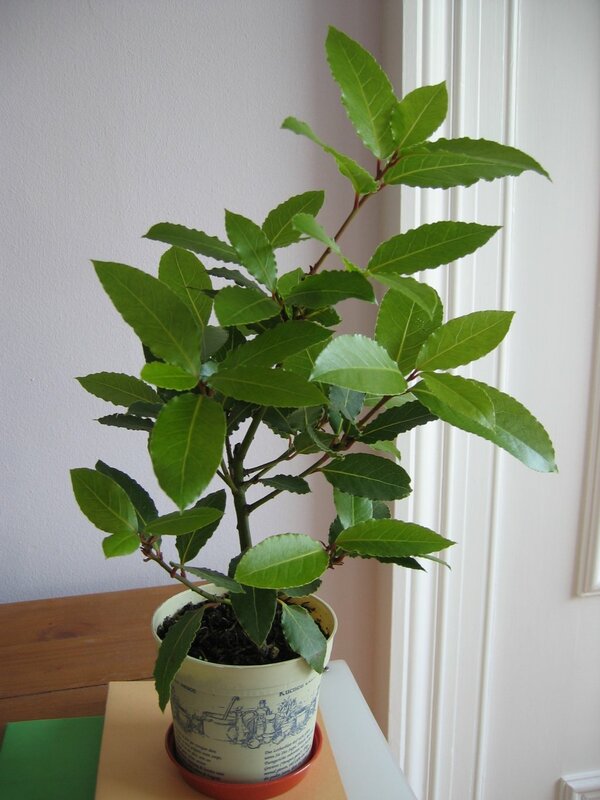 The bay tree is happy in the kitchen, again by the window, although this is a North North West (ish!) facing window , it does get some evening sunshine, but only a touch – and it's loving it there where there is plenty of light. It has been growing like mad. If you tend to buy pots of growing herbs, I would recommend getting them out of those poky wee pots and splitting up the best seedlings into larger pots of compost, 3 or 4 basil plants to a pot, more for mint or chives. I usually stick all the weedier seedlings back in the original pot and use them first, giving the better plants a chance to develop. When you're cropping the plants, remove a whole stem, say above the first two leaves…the plant literally grows two stems where you cut one off, so you should have loads of herbs within weeks. Basil and mint have worked particularly well as I use them most often. Of course you have to feed the plants once in a while, I've been recomended Tomorite and will be watering them with a weak solution once a week. 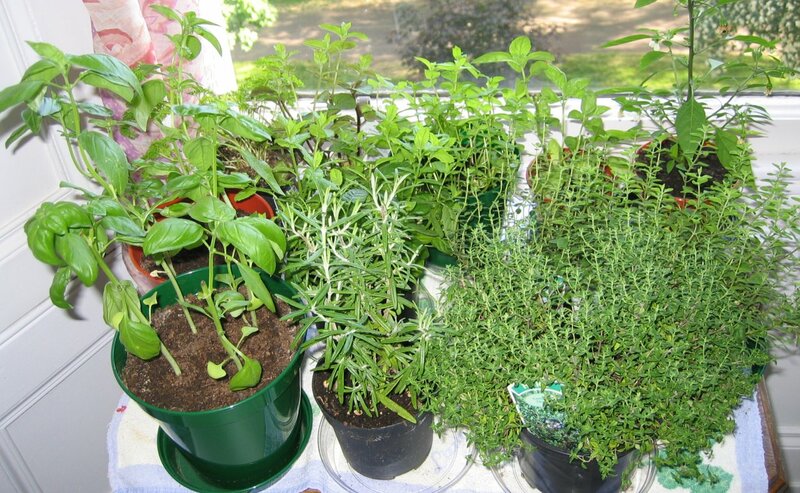 Get growing your own herbs too! Even if you don't have green-fingers, this is definately something to try. Start off with some growing basil or nip down to the garden centre and try it yourself. Highly recommended by the cookalicious tasters! Posted by cath in Recipes, stir-fry, variations, vegetables. I often find it difficult to find interesting recipes for vegetables. Cabbage is always a hard one. It’s often best simply steamed or wilted, but some more substantial cabbage varieties, particularly red cabbage and dark green cabbages, are really good stir-fried with steam, what I call: steam-fried. Steam frying can be done simply by shredding cabbage, followed by a quick stir-fry in a tablespoon of oil, then the addition of up to a glass of water, usually in one or two splashes. This method is quick and easy, depending only on how much cooking the cabbage needs. Once you’ve added the water to the hot stir-fry, put the lid on for 5-10 minutes with the heat turned down to medium. The steam wilts the cabbage, the oil or butter gives it a glaze. Test a bit to see if it’s done. If not, add some extra water as required and put the lid back on for a few minutes more. To make cabbage a bit more interesting, you can add herbs to the steam-fry. In this recipe I’ve used thyme, lemon thyme and chives along with a wee sliver of garlic in the oil. I’ve also finished the glaze with a splash of balsamic vinegar, which gives a slightly sweet edge and I think works nicely with cabbage. I also slipped in some nutty walnut oil – just a splash as I like that flavour in cabbage too. Add sliced garlic to the hot oil and quickly swish round the pan. Add any thicker herbs (rosemary, thyme) to flavour the oil a bit. Now add the shredded cabbage and stir-fry for 2 minutes, coating the cabbage with oil. Season with a little sea salt. Now add some water, making sure it starts to bubble. Half a glass is usually sufficient at this point. Put the lid on, lower the heat slightly, and cook for 5-10 minutes, shaking occasionally. The longer you cook the cabbage, the more likely you will need to add some extra water. Take the lid off and check inside for steam, add water and stir again if necessary, then replace the lid. Once the cabbage has wilted, remove the lid, make sure that you dry the cabbage by steaming off any excess liquid in the pan. To give the cabbage it’s final glaze, add the balsamic vinegar and stir through. Sprinkle the top with the extra herbs, some freshly milled black pepper and stir to combine. Walnuts added to cabbage make a great combination, similarly with brussel sprouts. You can add any herbs you like to this dish. 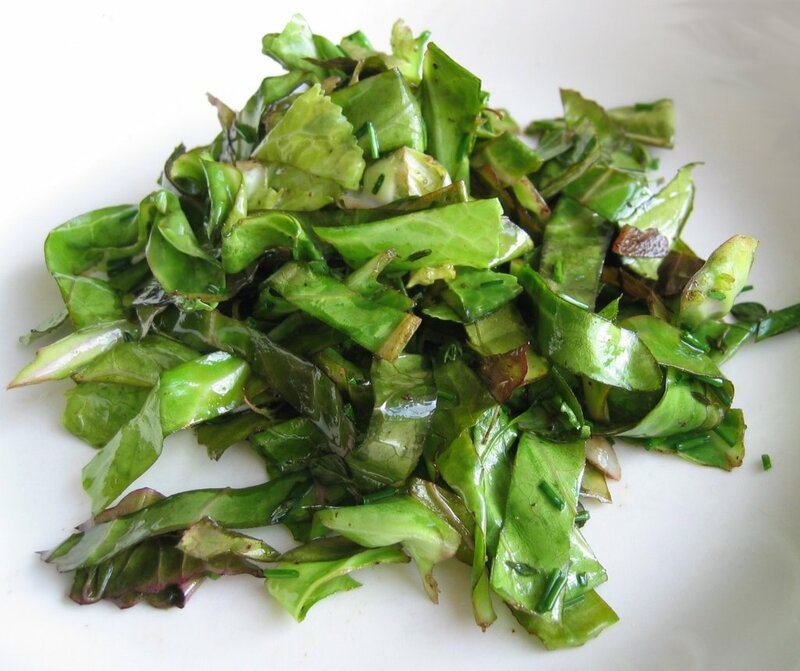 Meaty cabbage: Try steam-frying the shredded cabbage by first rendering the fat from some bacon or pancetta. Remove the fried bacon and any excess oil. Add the cabbage to the bacon fat in the pan, stir-fry and then add the liquid and steam for 5-10 minutes (less for sliced brussel sprouts) and then take the lid off and steam off the excess liquid. Now stir-fry some chopped walnuts into the cabbage and add the chopped crispy bacon back to the dish. I love making this with brussel sprouts and people certainly seem to enjoy it.